Hello Day 2! Happy to see you one pound lighter! I like to weigh myself every morning. It helps me stay focused on my goals and it helps me stay motivated when I see the scale going down. The “out of sight, out of mind” mentality with the scale has been one of the reason I gain weight. I have often though, “oh, it’s just one weekend of bad eating. It can’t do that much damage.” But one weekend turns into a month. If I stay diligent and hop on the scale once a day, my goals stay top of mind. Overall, I feel pretty good. I didn’t sleep very well because my son didn’t sleep very well. I think his canine teeth are coming in. But once we get these, we are done teething for a while!! Woohoo!!! Lunch is the same. Sorry folks, I just can come up with new menu ideas every day for breakfast and lunch! Snack number 2 is half and apple and a small bag of almonds. I did decide to skip the second Spark of the day too. I want to make sure I get a good night’s sleep after last night! 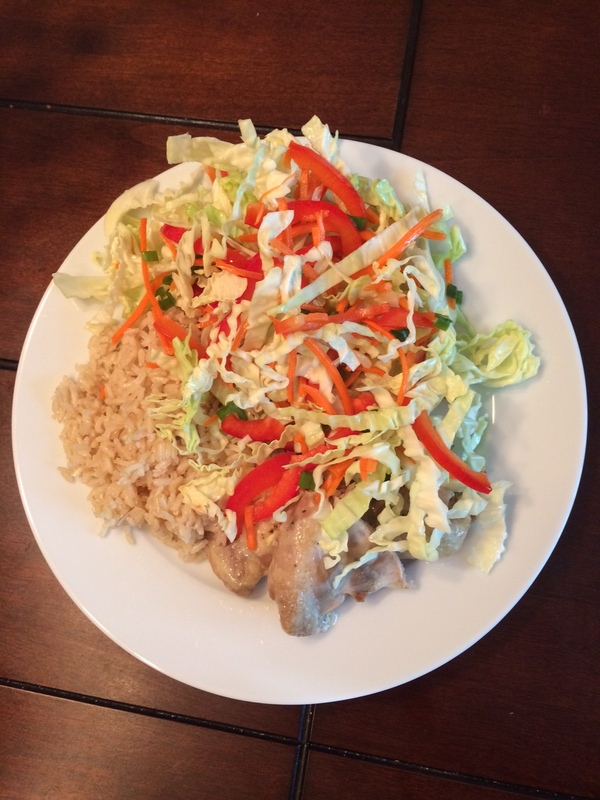 Dinner is this amazing Vietnamese Inspired Chicken and Cabbage salad from The Urban Poser. Check out their site because their pictures are way better than mine. We eat this salad almost every week. It is so tasty and full of veggies. Since the Challenge has slightly different eating guidelines than Paleo, I did serve this over brown rice. I skipped Snack #3 too. Just didn’t feel like I needed anything.